On the Online version, these features are available in the contextual menu of the 3D view once you logged in. Logged in... of course... I thought I was logged in. BUT: It does not create images in Q1 or Q2. We have tried on two different machines. Same problem. Could you try again with the Online version after you activate Java console? If some text appears when you try to create a photo, I would be pleased you copy paste it here to help me understand what's going on. Shall I release a version 5.5.2 already? Puh! I was starting to think my karma had gone bad. I'm okay finishing my project with version 5.4, so there's no hurry on my behalf. I'm sure your karma is ok, but mine is in bad shape for this release, even if regressions are unfortunately very difficult to avoid after programming important changes. 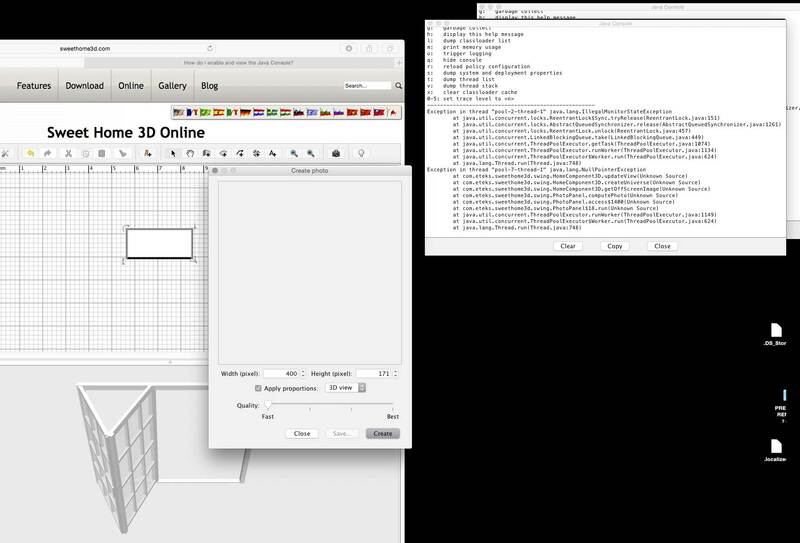 At least, printing and print preview work for the 3D view, and creating images work if you turn off the second monitor. As the users with two monitors who want to create pictures in quality 1 or 2 might be quite rare, I might wait longer before releasing a new version. I fear that the upcoming macOS High Sierra might require some more important changes if Apple doesn't fix the current issues with Java programs (in the current beta, Sweet Home 3D free DMG version doesn't work and the paying version has some problems with the menu bar). So I would prefer not to release a new version each week! Thank you for the new version, but I still miss the portable version. Unless you speak Ukranian, Slovenian, Slovakian and Korean and translate all the new words tonight in those languages, you'll have to wait a little longer. I don't know if translators will agree to continue their contribution to Sweet Home 3D translations for this version, but I feel we shouldn't stress them and wait their contribution a little longer, no?